If you need armadillo help, click Nationwide List of Armadillo Removal Experts for a pro near you. How To Trap An Armadillo - The distinctive armor of an armadillo is something that will often be sighted during the twilight of dawn and dusk, but even if people don’t catch sight of the animal itself they will often leave signs of their presence. Armadillos will usually find their food by digging below the surface to catch earthworms, and signs of digging in a garden will often be a sign that an Armadillo has been present. They are also known to adapt to urban life by targeting gardens and parkland with flat lawns that are a great source of insects and worms. 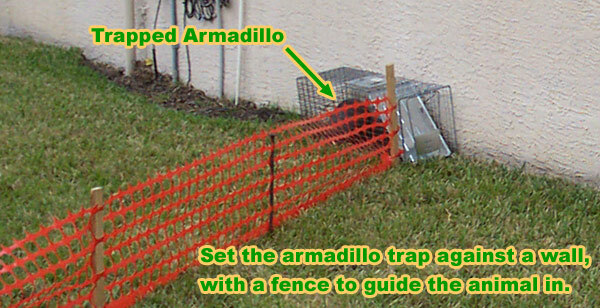 There is no need to buy a trap that has been specifically designed to catch an armadillo, as the usual one-way trap that will close behind the armadillo will usually be sufficient. These are commonly available in a hardware store, and choosing a trap that should be large enough to contain a small cat will be large enough to catch an armadillo. It is also important to choose a trap that is quite sturdy, because armadillos have large claws which are likely to be able to break any traps that aren’t too solid. There aren’t many lethal traps that can be used to catch an armadillo, and the main reason for this is that the armor of the animal means that it is difficult to have a trap that successfully kills the armadillo. Many people will use a trap without a bait to try and catch an armadillo, and because they normally eat insects and earthworms finding successful bait is quite difficult. Some uninformed people will use fruit, but this can attract other animals. Other people have attempted using an old sock or stocking that has a few earthworms inside, but this isn't necessarily helpful either. The most important aspect of trapping an armadillo is choosing the right location for the trap. For those who are getting in to a garden repeatedly they will usually have a typical route in, so examining your fences for holes or signs of burrowing can reveal a good place to locate the trap. Examining your garden to see where the armadillo is most active should also suggest a location that will see the armadillo go into the trap. Look out for particular areas of earth or grass that has been well trampled, and may be a part of the armadillo’s regular route in to or around the garden. Although armadillos are not noted for being transmitters of disease, this doesn’t mean that there are no risks in handling the animal. Avoid releasing the armadillo from the cage as they can be unpredictable, and they do have large claws which can be used aggressively if the armadillo feels there is no other choice. The trap that has been used to catch the armadillo will usually be good enough for transporting the animal, but the armadillo should be moved if you cannot relocate it for some time. For those who are trapping armadillos, it is best to check the traps every morning, as they are nocturnal animals that will usually be caught in the trap during the night. It is best to check your local regulations about moving and releasing an armadillo, because it is not a native species and will often have laws preventing its release into the wild. For those who can release the armadillo legally, it is best to take the animal at least five if not ten miles away from your home, and then release it in an area that is away from any urban properties that could immediately attract the animal. Homeowners are allowed, in Florida and Texas, to trap the animals in cage traps, but since they are non-indigenous (not native to the area) it is illegal to transport and relocate them. I consider this rule rubbish, so I've always relocated these gentle animals. No one is going to stop you, seriously, there are more important things to enforce in this world. However, just because you're legally allowed to trap them, it doesn't mean it's easy or you have the right equipment! Prepare to have your incorrect trap destroyed! One good reason to consider removing armadillos is because I've heard that	armadillos eat baby sea turtle eggs in Florida. Information about how to keep armadillos away - prevention techniques. This site is intended to provide armadillo education about how to trap an armadillo in your yard or property in Texas or Florida or other southern states and and information about armadillo trapping laws and type of bait to use to trap armadillos, so that you can make an informed decision if you need to deal with an armadillo problem. This site provides many armadillo control articles and strategies, if you wish to attempt to solve the problem yourself. If you are unable to do so, which is likely with many cases of armadillo removal, please go to the home page and click the USA map, where I have wildlife removal experts listed in over 500 cites and towns, who can properly help you with your nuisance armadillo. Click here to read more about how to get rid of armadillos.